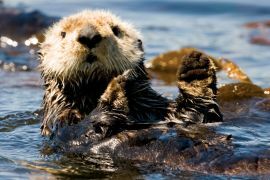 Recharge while sharing waters with sea otters and other marine life. 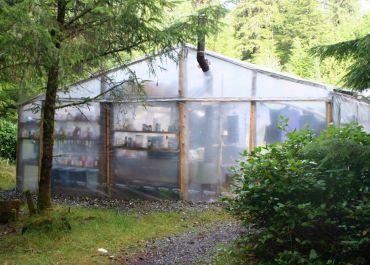 Experience the welcoming wonder of this remote part of Vancouver Island and the local Indigenous culture. This trip has been selected by Destination Canada as a "Canadian Signature Experience"! 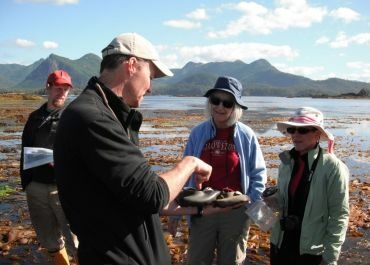 These trips conveniently begin and end from your accommodation in Comox/Courtenay or Campbell River on Vancouver Island, include van transportation, a scenic boat ride to our Wilderness Retreat Base Camp, and the perfect mix of personal and group time on the west coast. 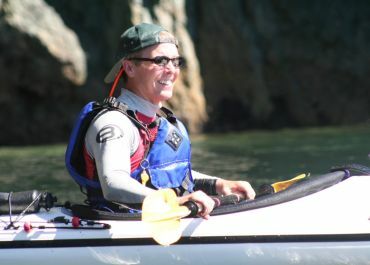 Our professional sea kayak guides enjoy sharing their knowledge and skills. We learning together with you! We are committed to helping you to feel comfortable if in a kayak for the first time, or to further develop your competence if already an experienced paddler. 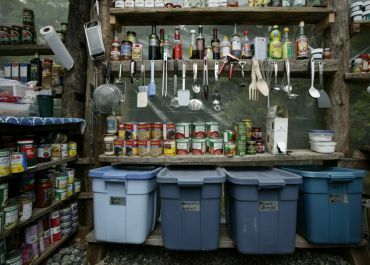 When on interpretive walks, if we don't have answers for your many questions, we'll try to find out more from our resource library in the dining and activity shelter at our island retreat. These 5-day (4 night) kayaking tours allow you to truly get away, relax, absorb, and fully enjoy a diverse west coast holiday. Rates are based on double occupancy. 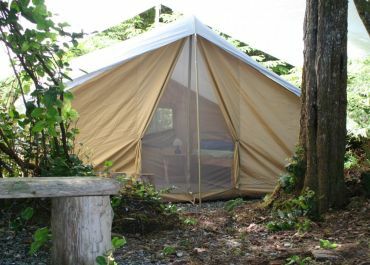 A $300 single occupancy upgrade may be available if wanting to guarantee having your own tent. If these dates don't work for you, consider our 4-Day Sea Otter Kayak Tour or 6-Day Sea Otter Kayak Tour trip dates! 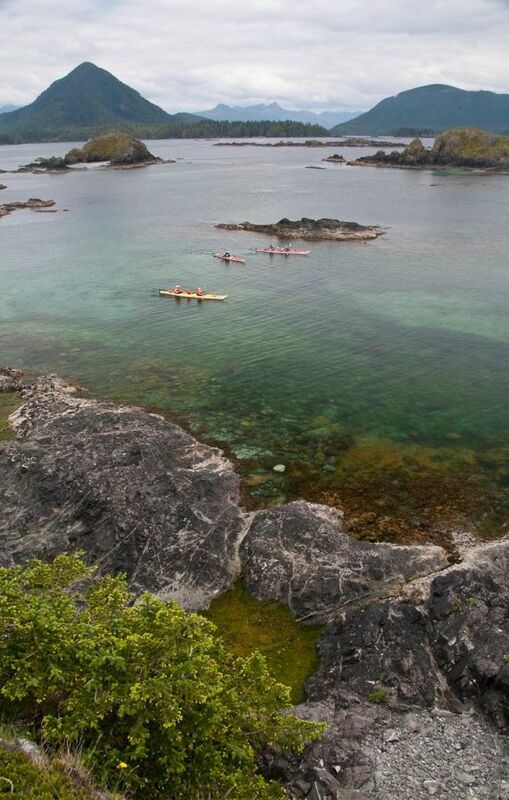 Each of these base camp sea otter kayaking trip options feature sea otters and other diverse marine life, majestic temperate rainforest, secluded islets, and the perfect balance of base camp comforts with flexible daily itineraries that suit all levels of kayaking experience and interest. My hat is off to the entire staff. You made my first kayaking experience fabulous! All that you really need is your personal clothing and a sleeping bag (which you can also rent from us) - we take care of the rest! A detailed packing list is included in your pre-trip information package provided after registering. Morning van transportation from your accommodation in Comox/Courtenay or Campbell River (unless you've arranged float plane transportation); four to five hour scenic drive on northern Vancouver Island to remote Fair Harbour; chartered water taxi transportation to our Wilderness Retreat base camp on Spring Island - on the outer edge of Canada's west coast! Start enjoying the sights, smells, and sounds while getting used to the 24/7 flow of tea, coffee, or juices and the always available bowl of fruit and snacks. We listen to the interests of each guest - "what are you most looking forward to experiencing, trying, or learning about?" ... and then begin activities that will suit the collective and individual interests: maybe a guided forest walk to stretch travel legs and enjoy beach-combing on some of British Columbia's most magnificent shorelines, or maybe an introduction to the kayaks with basic strokes and an afternoon paddle among sheltered islets.Relaxing introductory kayak outing or forest trail walk to spectacular and rugged exposed west coast shoreline and scenery - use your arms or legs and get your bearings! You've arrived! 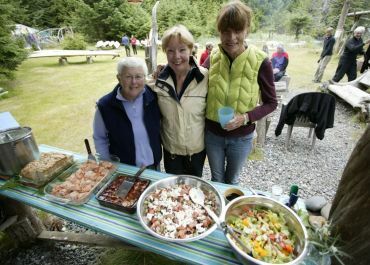 Yummy appetizers lead to a satisfying dinner well beyond what most expect while on a kayak trip and camping. Prepare for the next day's kayaking. Possible evening paddle in sheltered bay. Evening activities are usually less structured, providing you with time to fully experience what you're after - social time around the fire or on the beach with friends, family and staff; games in the dining shelter or meadow (bocce, croquet, or ladder golf! ); sunset walks; reading, sketching, or journalling; or sitting still in a quiet place, watching the gentle rhythm of the waves. 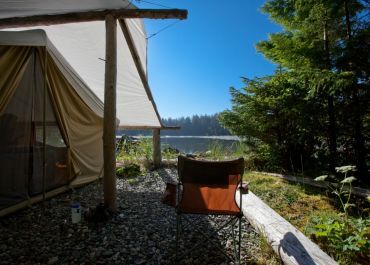 You might be woken by the caress of waves on the cobblestone beach, the morning mew of a Sea Otter pup in the bay, the call of a bald eagle overhead ... or simply the need to stumble out of the comfort of your tent to find a coffee to say hello to the day. After a tasty wholesome breakfast, we typically head out mid-morning to kayak tour through islet clusters, destined for an island, beach, forest trail, or nearby estuary to explore. We are surrounded by a myriad of route options, most offering perfect sand and crushed shell beaches for breaks, lunch stops, beach combing, exploring tide pools and rocky outcrops, or "savage lounging" (the paradise of a rejuvenating afternoon nap on an island in the pacific!). You may choose to take the day off from kayaking to just relax or explore Spring Island by foot while others paddle. On the water, we are likely to encounter Sea Otters while paddling near the calm waters of prolific kelp beds. And we may be greeted by jumping Salmon, snorting Sea Lions, squadrons of Black Oyster Catchers, or low-flying Tufted Puffins. Our sea kayaking options include a variety of day-trip routes, distances, shoreline types, and sea conditions to satisfy the range of guests' interests and comforts. Arriving back at the quiet bay of our camp around 4:00 p.m., there may be the opportunity to practice specific kayak skills (strokes, or for the hardy, re-entry techniques or the basics of rolling a sea kayak). Alternately, for those still wanting to play on the water, have fun with one of our stand-up paddleboards or "window" kayaks in the sheltered bay. After some evening appetizers, you may choose to go for a refreshing swim, wander the trails, settle onto the warm beach stones with a drink in hand, enjoy a hot shower, or visit by the fire (or if it's cooler and raining, by the warmth of the wood stove in our dining and activity shelter). 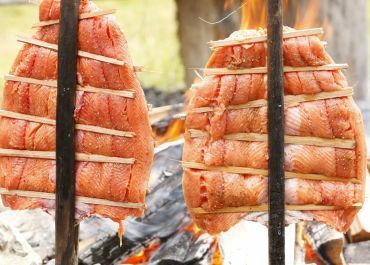 On one evening, a traditional Aboriginal cultural salmon dinner and visit, prepared around the campfire by local Kyuquot-Checleset First Nations hosts. 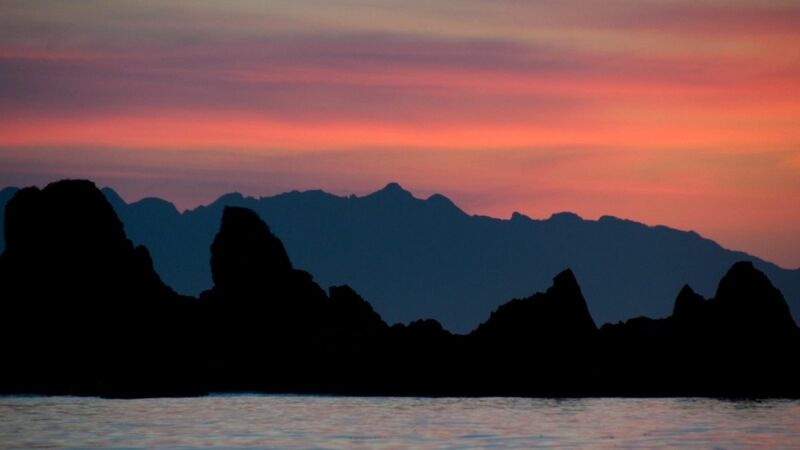 With a scrumptious dinner in belly, evenings are often enjoyed around the campfire, or with a sunset walk to the exposed west side of Spring Island. We also have the option of using the kayaks for sheltered and unparalleled sunset paddling, full moon paddling, or night-time paddling with the darkness lit up by the magical underwater sparkles of bioluminescence swirling off each paddle stroke. Your 3-4" foam mattress and bed will eventually lure you to rejuvenate for the next day's adventures. As per previous days, we have the morning to explore a little closer to camp: possibly a sunrise paddle (optional for early birds! 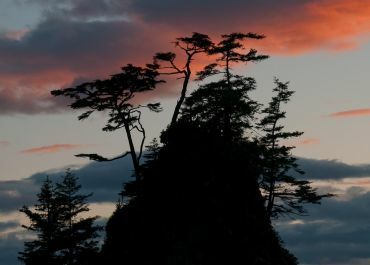 ), or a kayaking circumnavigation of Spring Island or nearby Aktis Island if the conditions are suitable. 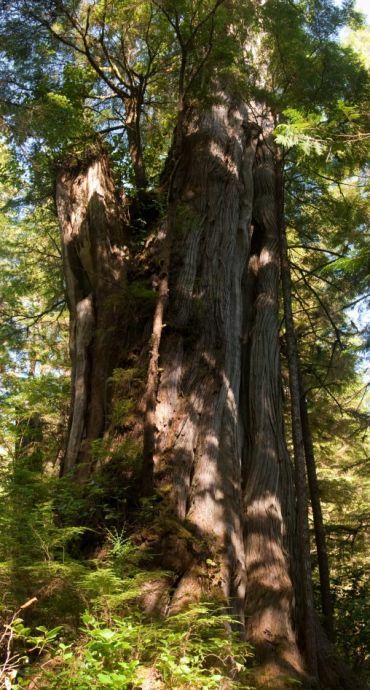 We can also enjoy a morning walk through a moss-laden old-growth forest trail to visit ancient Western Red cedar trees - this feels like you're stepping into another world on Spring Island. After our last lunch together and goodbyes, it's time to take the spirit of your Spring Island experiences home. This is also a good time to start scheming and planning your next visit and kayak trip - many of our guests have returned over 6 times, and some even 15 times! Depending on your travel arrangements, you will depart from our beach in the early afternoon by water taxi or float plane, ready to return for your next west coast kayaking adventure with us! ... And feeling like you've truly had a kayaking vacation full of holiday memories to carry you through the year. What a fantastic week! Thanks for the exceptional hospitality – no detail was overlooked.